Hold on to your butts, people. Ford Racing and Roush Fenway Racing have unveiled their new stock car based on the poniest of pony cars. Prior to this, Ford teams in NASCAR have driven Fusions. Well, all right, none of them were actual Fusions or will be actual Mustangs. Rather, they’ll be normal stock cars like everyone else in NASCAR drives that are covered with enough stickers and fake grilles to make you think that you might be looking at a Mustang from the stands. Man, “stock car” has really become a contradiction in terms. Now you won’t see Mustangs turning left next week in Charlotte at Lowe’s Motor Speedway. The new car will compete in four races next year and only in the Nationwide Series, not the Sprint Cup. As such, it won’t be based on the Car of Tomorrow platform that the Sprint Cup series uses, but rather the newer, different Car of Tomorrow platform designed specifically for the Nationwide Series. This first new Mustang to race in the Nationwide Series will be the No. 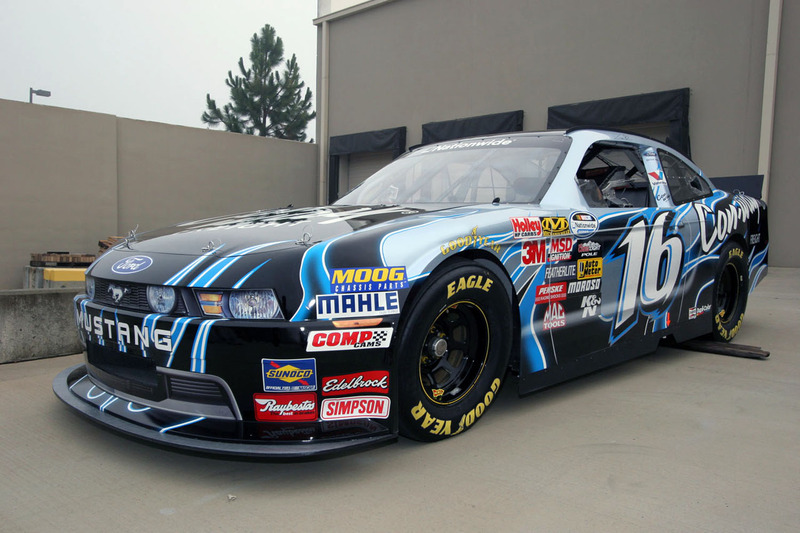 16 Con-way Freight Mustang driven by Colin Braun for Roush Fenway Racing. Is it enough to make us love NASCAR? Not quite, but if we had to race a bathtub on wheels, we’d pick this one.